Looking for the next game-changing idea. It's a noble cause. One whittled away at in meeting after meeting, google search after google search until we reach the breaking point: It's time for a brainstorm. We gather interesting people from around the company. Arm them with carbs, caffeine and Sharpies and hope for the best. Sometimes they turn out the big ideas and sometimes ... they fizzle into frustration, aggravation, or even general malaise (I always wondered if I could get "general malaise" into an advertising blog post). The knee-jerk why it won't work response: At their best, brainstorms are about gathering as many new ideas as possible. The editing comes later. It's nearly impossible to get idea momentum going when your energies are divided between defend and develop. Mired in just how it will get done: There will always be details to be worked out. The pixel dimensions really do not matter right now. Big picture, people. The focus group of one: The self-appointed expert who takes the stage claiming he can speak for all people who have ever enjoyed a Cheeto because he himself has been eating Cheetos so long that the little strips of skin under his fingernails are so permanently tattooed orange that he appears to have had a strange form of a french manicure (potentially one with a Halloween theme). Let's keep it open - every product has lots of different customers. But how can we do it better? What can we do to keep the ideas flowing and the enemies at bay? I think a successful brainstorm is the responsibility of both the facilitators and participants. Stimulus: What new information or experience can get us going? An inspiring video, a site visit, a new data point. Instant feedback: Let people know they'll get a chance to not only share their ideas, but vote on what they think will work. "Before we leave today, I'll ask you to put a hash mark next to the 5 ideas you like most..."
Say yes and...: It's the ultimate brainstorm discipline. Can you build on an idea - add a new angle, make it better, create another application? Tagging: Give your ideas a headline. Not only easier for whoever is capturing the ideas, but also good way to get to the sellable proposition. Table the usual suspects: Agree in the beginning that you'll do all the obvious stuff (like get a project manager or create a brochure). Concentrate your in-brainstorm time on more unusual ideas. I do enjoy reading the lovely Tara Hunt’s insights on social media in action over at Horse*Pig*Cow and, of course, in her book The Wuffie Factor. One of my favorite ideas is The Soup Metric. Defined: The soup metric is the number of people in your social network who you know would bring you soup if they knew you were sick and/or get your back in any other real friend way. The big idea is: For those native to social media, there’s isn’t necessarily a big difference between our close-knit personal friends and our strongest business/online relationships. The people who will go to bat for us no matter what are our people. Doesn’t matter how we came to know them. Or where we talk to them most frequently. I’m confident that if I was sick and needed soup, I could Tweet just such a mopey request and a number of someones would come to my aid. I know that because I would do the same for lots of people I’m connected to – even some I’ve never directly met. I’ve often tried to explain this dynamic to spectators or adopters. They ask: Isn’t Twitter just a bunch of people saying what they ate for dinner? And, I say: No, people use it lots of different ways. Primarily, they form ad hoc groups for socializing, sharing ideas or just supporting one another in everyday-tough situations. They look at me quizzically. I try again. To make my city smaller: Lots of Columbus people participate in social media – on Facebook, Twitter, and blogs. Getting to know them here lets me connect with a broader range of people than I might otherwise encounter. It helps me find new places, events and things worth checking out – and, ensures I’ll know someone when I get there. It’s knowing and being known in my adopted hometown. To give and take ideas and resources: I read a lot. But, there’s so much information out there, I could never even hope to get to 1% of it. Online, I share links and mini reviews of my favorite content and count on my network to do the same. Together, we’re like a sassy high school debate team of data. And, it’s true: I use Twitter instead of a ladder. My ladder weighs at least 60 pounds. The thing is wicked configurable and nearly impossible to lug up the stairs. So when I have to change a light bulb in some lofty location, I climb on something totally inappropriate to the task (hamper, bar stool, and, once, a kitty condo tower). But, first, I tweet that I’m about to do something dumb & if I’m not heard from in 10 minutes to please send for help. About the T-shirt: Threadless has this great new online Twitter store featuring shirts with crowdsourced Tweets. Submit one or buy one here. Can we just take a moment to be truly honest with each other, dear readers? It’s weird when incredibly smart, fresh, relevant social media advice comes from the mouth of a 50-something, right? Hell, most of the time I feel completely out of touch in this category myself… especially, as it turns out, when I’m getting schooled by a grey hair. This week: Ologie and Benefactor Counsel hosted a series of events for fundraising professionals and greater good leaders featuring Richard McPherson, author of Digital Giving. 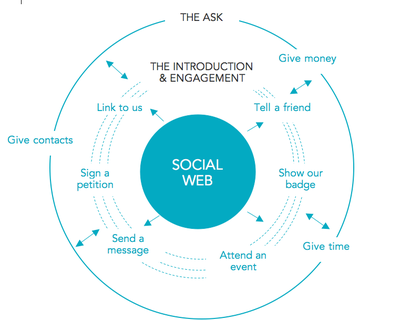 I was lucky enough to attend two of the sessions focused on how to use social media to connect with new donors. And, I have to say – if you’re looking for a speaker who (1) totally gets social media, (2) has been there/done that credibility and (3) can deliver advice that is relevant, clear and actionable … well, this is the guy to call. I’m already integrating some of the things I learned. The messenger is critical. You want that person / organization to create confidence. To endorse your organization’s brand. Ask yourself: If an opportunity presented itself today, are you ready to quickly communicate with all of your constituents? Do you have their email addresses, cell phone numbers, etc.? “Email is an old person’s medium. You have to be able to think beyond it.” But also use it strategically to reach boomers – it’s the bread & butter of their giving. Why add mobile to your strategy? Big takeaway: “You don’t teach your donors; your donors teach you” Donors are changing the rules of the game. It's up to us to learn it. What's better than wandering the aisles of Meijer when you're hopelessly awake past 3AM on a Monday? All those wacky / expensive / off brand / scary ideas the AE wouldn't even let you get in front of the client?? ... yeah, whip 'em out. 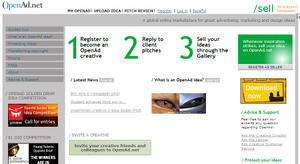 OpenAd is a virtual bazaar of spec creative work. Read the RFPs. Submit your best idea.Winner takes the purse. And, the credit. Sign up as a freelancer or make your entire creative department flex their noggins. 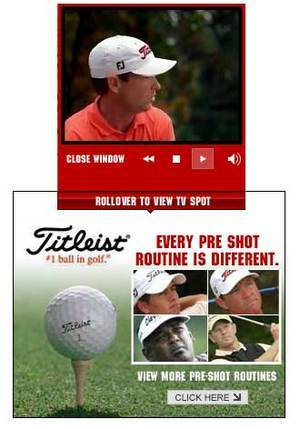 Here's an interesting video ad technique I hadn't noticed before - rolling over the ad causes the video panel to expand and take over the page content without leaving the original page. Nice balance. For most agencies and clients, email marketing still has a strong hold on interactive communications. In many cases RSS (which some of us rely on daily ... um, hourly) hasn't even really hit the radar. With email marketing maturing and declining quickly, many savvy marketers are looking to RSS as the next logical opt in communication - and, as a huge proponent, I want to help get the word out. RSS [Real Simple Syndication] lets users (also known as people) choose what content they want and where they want to get it. They can look at information when they have the time or desire to do so, rather than planning to get back to yet another message in their crowded inbox. The most ubiquitous users of RSS are bloggers. But, RSS – or the ability to subscribe to content – can been enabled on most any database-driven Web property. And, with the correct administration, RSS can also be set up to power email – enabling users to subscribe to email updates daily, weekly or monthly. Many cell phone companies, free email providers and others are also starting to integrate RSS readers in their products. If you haven't already, click through and read the article. For the client who believes in less, Nick Grouf and David Waxman, founders of PeoplePC and Firefly, have just introduced Spotrunner - a virtual vanity press for low rent TV spots. Do-it-themselves advertisers pick from 1,000 generic modules of pre-existing, professionally shot spots that cost as little as $350 to lease. They add their own title cards and/or voiceovers and taglines. It’s not just account execs and creatives out on the street, though. Spotrunner lets users take over the media department, too, with a detailed media schedule featuring à la carte prices that’s as user-friendly as ordering an item from an Internet retailer. Bravo in Berkeley, Calif. between 6 a.m. and 9 a.m. will cost you a whopping $5. Want to advertise pizza delivery on ESPN when the local team is playing? That will run you $88—the profit on, say, 30 large pies?